Porsche will sell its latest 911 RSR GTE contender to customers for next season. The German manufacturer had previously stated that it had yet to make a decision on the supply of the 991-shape contender to privateer teams or to deny speculation that it would only release the car after the Le Mans 24 Hours in June. Now, it has revealed that it will produce customer cars in the evolution or 2014-specification that raced for the first time in last weekend's World Endurance Championship finale in Bahrain. The decision was announced as the same time as it confirmed its return to the GTE Pro class of the WEC with the factory Manthey team. 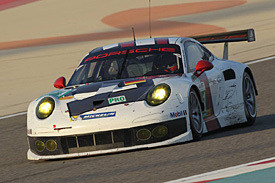 Porsche Motorsport boss Hartmut Kristen said: "The decision has been prepared over a long period; we had to make sure we had the correct resources and that took a while. "We had to make sure that we could provide the private teams with the support they need - you cannot just provide a car." Kristen revealed that Porsche was in discussion with potential customer teams looking to race in the WEC, but stressed that the car would initially only be available in limited numbers. "For Silverstone [the opening round of the 2014 WEC next April], more than three would not be possible. "We are having discussions with a number of teams, but we know that not every discussion will have a positive result." Stalwart Porsche entrant Proton Competition has revealed that it will enter at least one 911 RSR in next year's WEC and has ambitions to run a second car. Should a second full-season entry not come off, it plans to enter an additional car for the Le Mans 24 Hours in June. The French Imsa Performance has no plans to upgrade from its existing 997-model 911 GT3-RSR on grounds of cost. Porsche has yet to release a price for the latest RSR, but sources suggest it is in the region of €800,000 (£660,000). Kristen revealed that he did not expect any true customer cars to race in the United SportsCar Championship in the US. Team Falken Tire has already announced that it will have a RSR for next season's USC, starting at round two at Sebring. Kristen explained that Porsche supported the Walker Racing-run team "in a different way" to regular customers because of Falken's development needs as a tyre manufacturer.